How do you feel about orange lipstick? Does it make you think of Halloween? 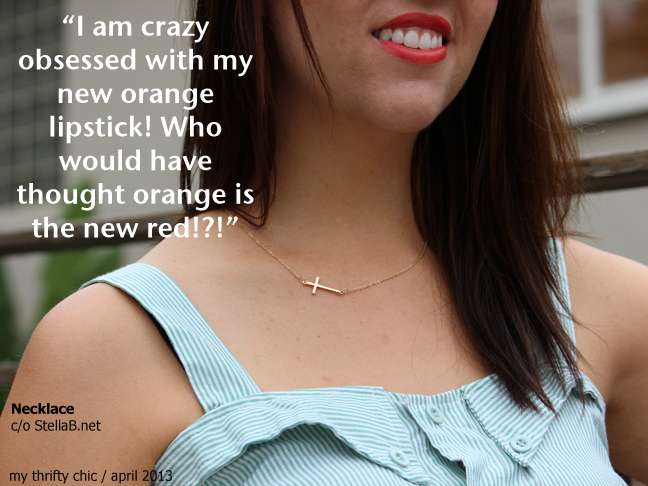 Well, I am here to testify/predict that orange lipstick is going to be the hottest color this summer! I personally love Wet n Wild's matte lipsticks, and I was really excited to try their "purty persimmon!" It's more of a red-orange, not a yellow-orange, and it is surprisingly really flattering! I never thought I would be trying to sell you on orange lipstick, but I definitely recommend you try it, especially if you have an olive complexion! I feel like that pop of color on my lips is what just was this outfit needed! 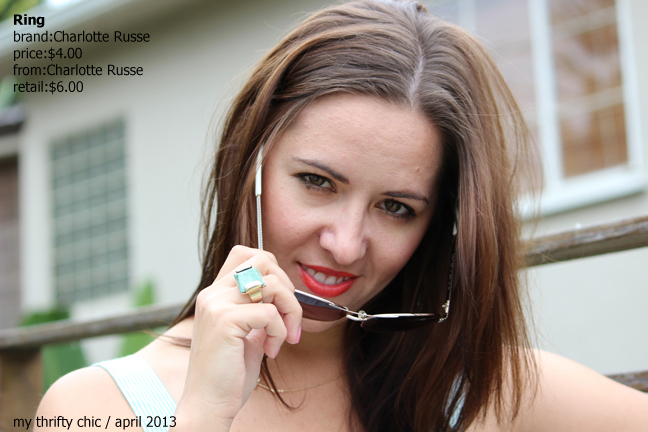 Now, onto our blog hop! 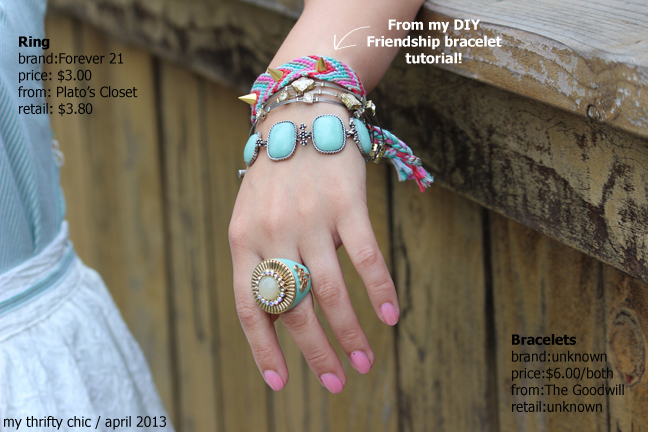 For those of you new to our blog hop, it's really simple! 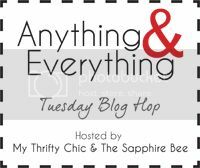 Brittany and I host a weekly blog hop every Tuesday. The post goes live every Tuesday morning at 12 am EST. Please copy and paste our blog hop button to your page (either on your sidebar, or within a dedicated post), then link up your most recent URL. Please feel free to share anything you've been working on lately; from fashion, to food, to fun and everything in between! I personally read each and every one of your links, and I appreciate your support and participation! I have never tried an orange lipstick but you definitely inspired me to! Looks great on you!!! What thrifting luck you have! Those shoes are awesome, and that skirt is too cute! I've been meaning to try orange lipstick, but I'm not sure how it would look on my skin tone. Maybe I'll look sick or something. Like physically ill. Lol. Guess I won't know till I try! It does look really pretty on you. It's a good tone of orange. Love this orange on you! And your outfit is great! Thank you for giving me a heads up on this blog hop! I LOVE all the mint and then a pop of orange! Looks so chic for spring! I love mint! Cute outfit........and so thrifty!!!!! I actually just picked up an orange/red lipstick over the weekend and LOVE the color! It looks great on you and those shoes are fab too. Such a steal at $10! What a fun monochromatic look, that lipstick is such a pretty shade on you too. Thanks for the link up! I'm really into coral lipstick right now, which are very close! 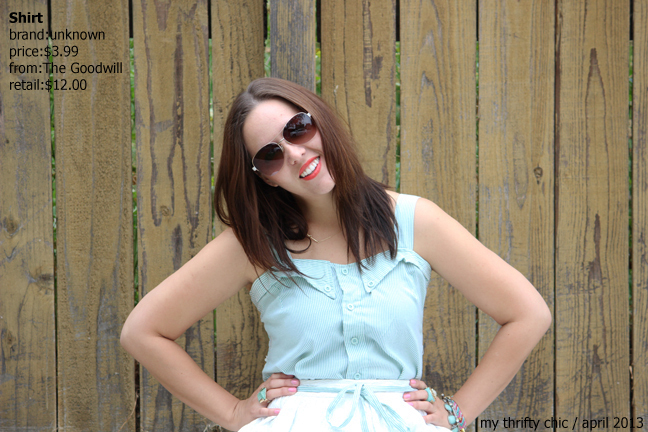 I love the colors of your outfit and that top is so vintage feeling...much like my blog today! Thanks so much for the link up! Such a cute outfit!! You look adorable! 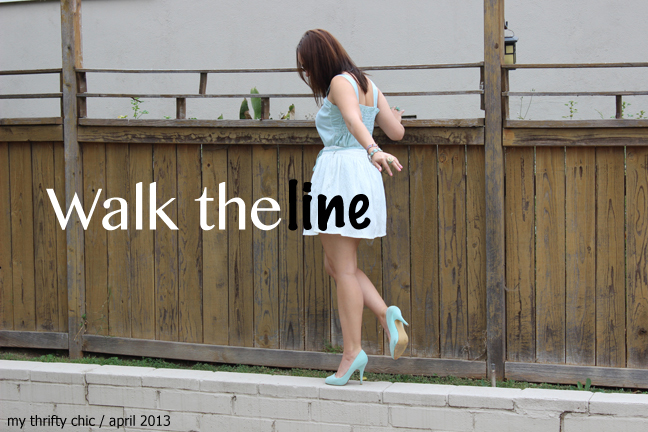 Tomorrow will be the debut of my fashion linkup called "trending pretty"! Would love to have you!! I really like the powder blue on you. Pastels are so pretty this season! The fun lipstick color adds a perfect punch of pow! I am going to have to try it out! Super cute outfit, nice and springy! And I love the lipstick, too!! You look gorgeous! The teal blue with the pop or orange lipstick! So pretty. 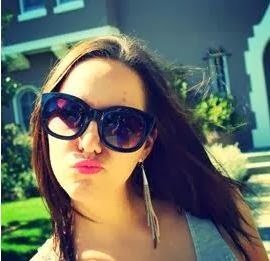 I have an orange lipstick that I LOOVE too! You look so cute! Really love these shoes! The lipstick is gorgeous! i love this outfit too. I don't know if I could do it - I already feel odd with lippie on. I wouldn't say I wouldn't try though so thanks for your recommendation, and it certainly looks fabulous on you. Thanks so much for hosting to you both. Thanks so much for hosting the link up again! I love all your jewelry, and the orange lipstick is fabulous! Who would have thought? Love the orange lip with the light blue dress! Hosting a giveaway on my blog if you're interested!! I adore those shoes! What a find! I like your lipstick too. Orange is a great neutral. I'd always heard it makes a person's teeth look yellow but it's not true. You have a wonderful smile and nice white teeth. The perfect accessory to any outfit! Great find as always Tori! I have never used an orange lipstick but it looks great on you! Love your outfit! I don't think I could pull off orange lipstick, but you definitely can!! I like your orange lipstick - in fact I was thinking I needed to buy that or a pale peach for my springtime fashions. I love the color of your heels! That's a very pretty, and ladylike outfit! Such great soft colors in this outfit! Hope you don't mind that I stole your button to add to my link ups page ;o) Looks fun, I'm going to try and link up this week! I haven't tried orange lipstick yet, but I've been really into bright pinks lately. I only recently tried any bright lipsticks, so I am excited to try out an orange.